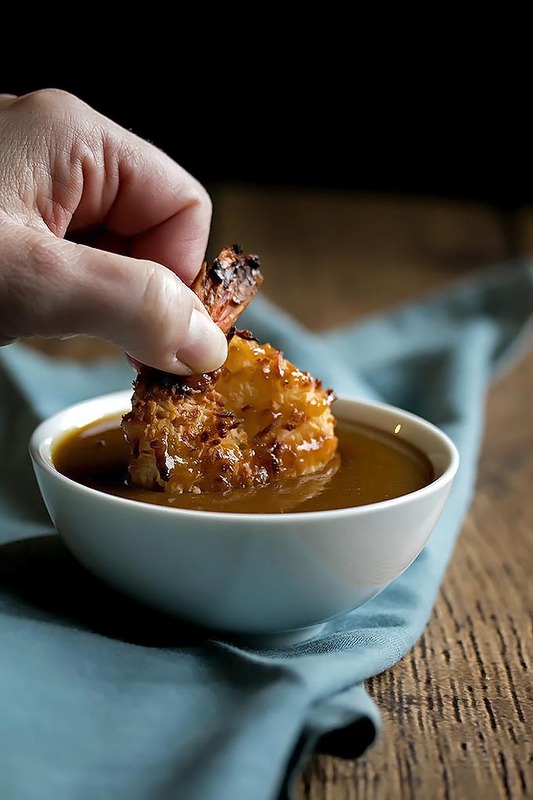 Tender coconut prawns coated in grated coconut, baked till golden and crispy then served with a sweet and spicy dipping sauce made with fresh pineapple and roasted habanero. I am not a huge seafood person. I like it once in a while, but I hardly ever crave it. That said, I could eat these coconut prawns all day long. And since they are baked instead of fried, I feel justified in eating these until I’m stuffed! 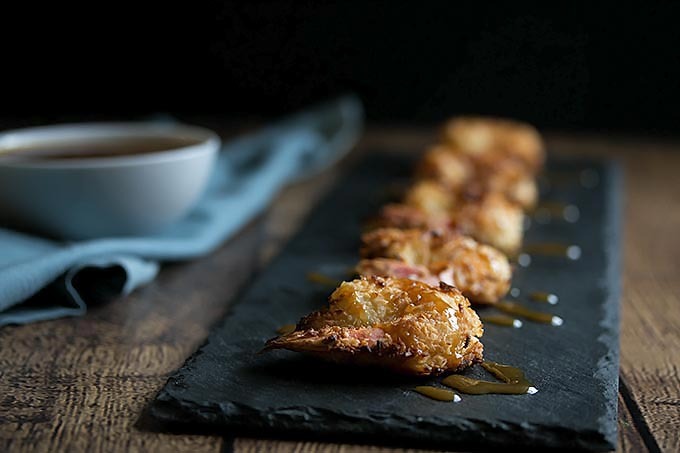 Tender prawns coated in grated coconut, baked till golden and crispy then served with a sweet and spicy dipping sauce made with fresh pineapple and roasted habanero. Its finger food heaven I tell you. Debbie and I wanted to make this recipe as healthy as we could without compromising any flavor. So that we can eat lots. And often. We saw that most recipes used the sweetened coconut for their coconut prawns, but it is REALLY sweet so we opted to use only a little sweetened and the rest unsweetened. You could go with just the unsweetened if you wanted to, we just used a little of the sweetened because for some reason the coconut is grated bigger with the sweetened version and we wanted those longish bits that stuck out a little. We also went with cornstarch as the first coating, instead of flour, so these prawns are also gluten free. 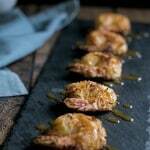 These are a great option for people with gluten sensitives and can’t eat the regular fried prawns. I think they are better anyway as the coconut gives these prawns much more flavor than a regular old batter, or even panko crumbs for that matter. I made ours with dark cane sugar, but if you made it with a lighter sugar, the color would be more pineapply and less dark. If that matters to you. 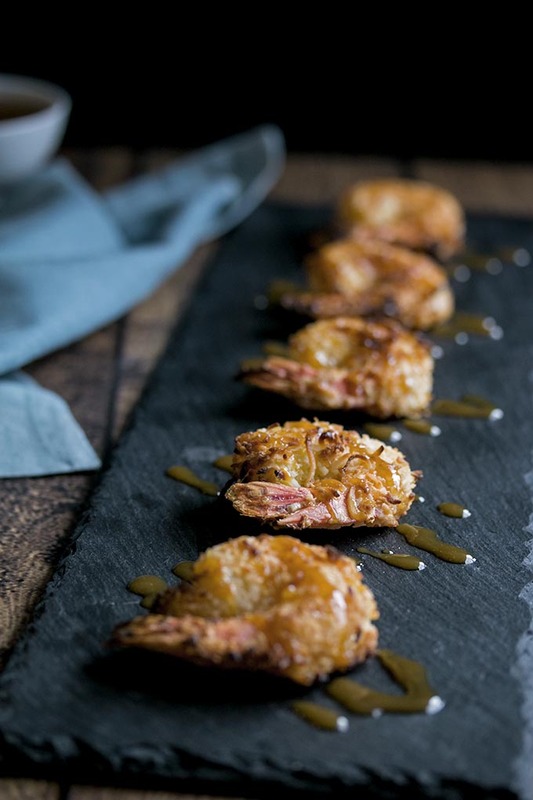 These coconut prawns would be da bomb as an appetizer for a party either put out on a table, served individually at a fancy party, or as a first course at a dinner party. A definite must for a tropical themed party! These coconut prawns in particular. Since they are baked, you can cook a whole tray at once rather than batch cooking the same amount in a deep fryer. You could even do two trays at once in the oven, or prepare two trays at once, cook one and serve it while the other is cooking. 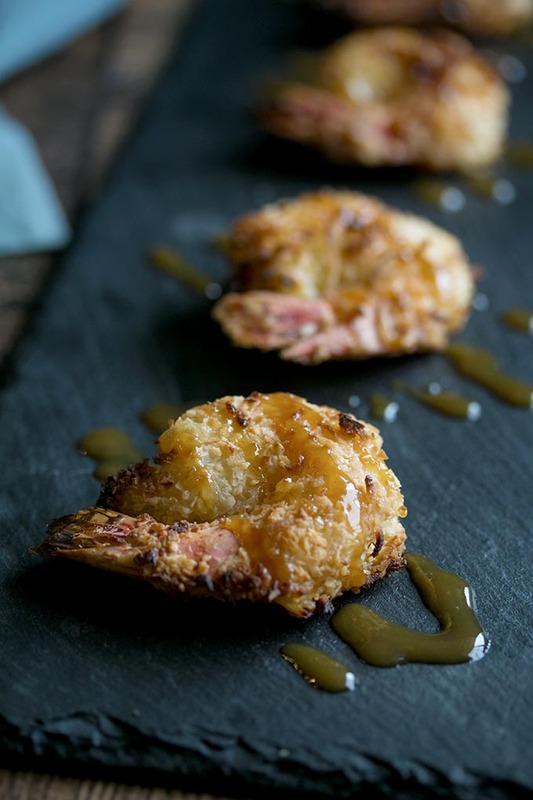 Now since were talking about a tropical themed party, wouldn’t a Pina Colada go perfect with these Coconut Prawns? Or maybe a Cajun Salsa with Prawns and Avocado and a Mai Tai or two? How about all the above?! Hey it may be nearing the end of February, but its always a good time to be thinking about the Tropics. Make the sauce first. Throw all the ingredients into a blender and blend. 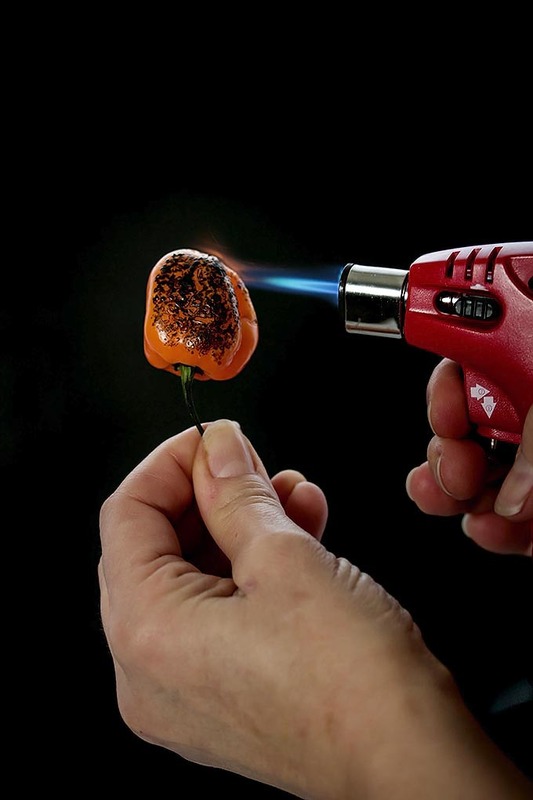 Start with 1/4 of the habanero. Blend for a few seconds. Taste it and add more habanero if you like. Just 1/4 at a time. Then blend to your desired consistency. If you like it more smooth, blend a little longer. Add the contents of the blender to a small pot and bring to a simmer. Simmer for a couple mins until the cornstarch works its magic and the sauce becomes thicker. Set aside to cool completely. Prepare a baking tray with parchment paper and spray the paper lightly with oil. Get out three plates or shallow bowls. Add the cornstarch and salt to one, the eggs to another, and the sweetened and unsweetened coconut to the last. Beat the eggs with a fork. Take each prawn and dip first in the cornstarch. Tap off any extra and then dip in the egg. Finally, dip the prawn in the coconut and make sure it is well coated. Place on the baking sheet. Repeat with the remaining prawns. Bake the prawns in the oven for 15 mins turning them over half way through. Serve right away with the habanero pineapple sauce. This sounds amazing! I love fried shrimp, but usually stay away because of the grease. I’ll give these a try!! Hi Sarah! I hear you about the grease. None with these 🙂 Hope you enjoy! Woah. . .I had to scroll down because looking at those prawns a second longer was undoubtedly going to drive me crazy. They look absolutely divine (it doesn’t hurt that I am a sucker for anything coconut-y). Then, I find out they are baked. . .so. . .what you are saying is that I can scarf down a whole plate without feeling guilty. Awesome recipes! Cooking with coconut is one of my favorite hobbies. It is so tasty. Thanks. This recipe looks nice. I will try to make the one coming the weekend.Thank you.